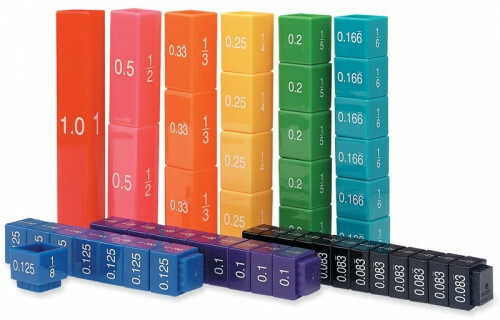 Illustrating the relationship between fractions, decimals and percents is a snap with this set of 51 colour-coded cubes. Durable, interlocking cubes feature fractions, decimals and percents clearly marked on each side, providing students with a visual representation of equivalencies. • Colour-coding helps students apply their understanding of fraction concepts to new contexts. • Illustrating the relationship between fractions, decimals and percents is a snap with this set of 51 color-coded cubes. Durable, interlocking cubes feature fractions, decimals and percents clearly marked on each side, providing students with a visual representation of equivalencies. • Children learn by building simple, graphic mathematical models that clearly demonstrate the relationship between the parts of a whole. Cubes can be used alone or with Fraction Tower® Activity Sets. • Color-coding helps students apply their understanding of fraction concepts to new contexts.